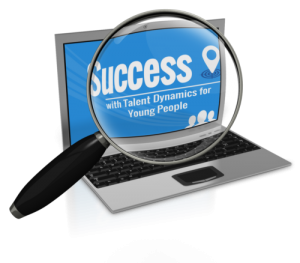 Talent Dynamics for Young People (TDYP) is the No. 1 personal development tool for tweens and teens. It identifies individual characteristics and aptitudes that can help a young person to be successful. Our students are our future leaders and it is important they get the opportunity to discover what they are good at, what are the best roles for them in teams and groups, how they can contribute and play their part, and develop skills to apply to school, home and life. TDYP is designed to help a young person know what are their natural strengths and weaknesses. Everyone is different and has a different way of getting into ‘flow’. Flow means doing what they enjoy and what they are naturally good at doing with minimal effort. Time flies by and they have fun. When they can acknowledge their weaknesses they can be open to how to use their natural talent to fit in and work with others to be successful. After completing an online multiple-choice questionnaire the student will receive a TDYP profile report. This report provides a lot of detail about the young person’s profile. This information helps them to make decisions about their future direction for whatever stage they are at, e.g. school, college, university, workplace. Created by Roger James Hamilton, Talent Dynamics is an extension of Wealth Dynamics – a unique personality profiling system for entrepreneurs and leaders, which is currently used around the world. Whilst Talent Dynamics was developed for and geared to corporate companies, the same highly successful profiling principles have now been re-tailored to meet the specific needs of young people. Talent Dynamics is based on a long history of tradition and scientific research. It comes from a 5,000 year-old Chinese system of thinking called the I-Ching, which was developed and recorded by a series of Chinese emperors and teachers. The I-Ching made its way to the West when Richard Wilheim translated it and brought it to Carl Jung for publication in 1919. Jung was so taken with the I-Ching that he drew upon it heavily for his book, ‘Psychological Types’ and his theories on ‘Synchronicity’ and the ‘Collective Unconscious’. Jung pioneered psychometric testing in the West, and any of the personality tests you are asked to do in any job application come from these same roots. 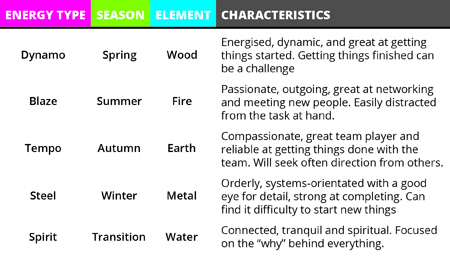 The ancient Chinese philosophies describe five natural “energies”, each linked to a season (one of which is called “transition”). These energy types are described by character traits that we can easily recognize. “When you follow your flow, you find yourself”. Each of us has a mix of these energies that contribute to the whole of who we are. 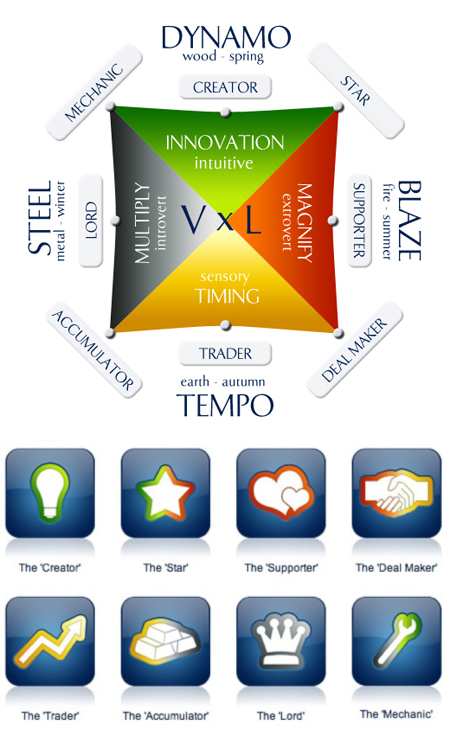 The Talent Dynamics Square illustrates the relationship between the four energy types and the eight Talent Profiles.